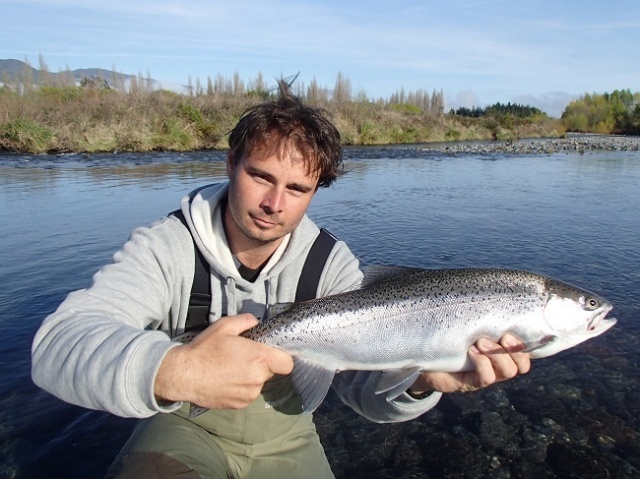 Hi again, Wow, yesterday was slightly mental on the river with fisherman on every single stretch of the Tongariro. Infact it continues to be busy most days especially in the mornings, in many cases lately it’s been better fishing in the afternoon when the crowds have left the best runs alone for a while. I have been lucky enough to be out for the last seven days and can give you a good up date on what’s been happening. Early in the week I again had goodÂ friend and clientÂ Phil Norman and a couple of mates from Brisbane. After missing his flight, leaving his luggage at the airport and loosing his polaroids all in 24 hrs we managed to get on the river and dealt to some very good fishing. I actually went up the TT on Monday while the river was slightly high and coloured and had some very good fishing with silver bullets which have moved in with the flood ten days ago. 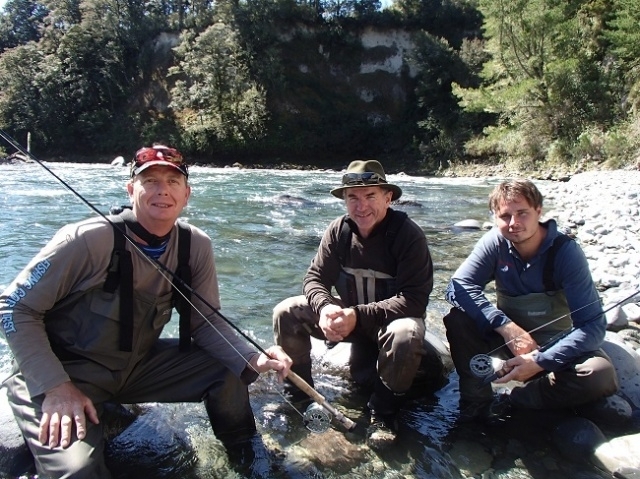 On the Tuesday we rafted the opening day on the Whakapapa while the river was again quite high and discoloured which was generally very hard going and we only hooked about 8 fish for the day. The trout we did get backcountry were in very good condition if they were maiden fish but the spawning fish from the last winter were still quite tired and skinny. These fish will be putting on weight over summer and with low conditions this fishery will fish well again, backcountry is always hard when things are high and dirty. DOC have been on the rivers and throwing their weight around with aÂ few fisherman while checking licences. I could not believe my eyes when a DOC officer confiscated some “locals” gear on the river mid week right in front of me and my clients. I couldn’t help but smile as the usual tough guy puffed out chest tactics took place, this is the exact action which is needed to enforce the law in which we obey by. I was also checked today while fishing the Hine, so they are about which is awesome to see. 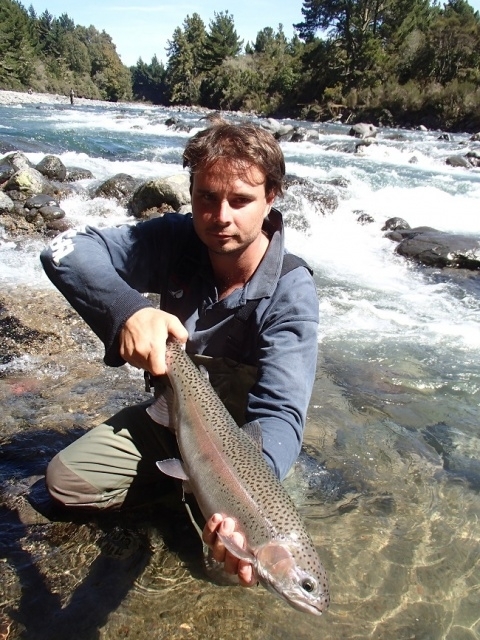 The Hine is back to low and clear with plenty of spawning or coloured fish in most of the river. I fished the middle section today and was able to polaroid plenty of trout for my clients. They were not easy to catch but annoying the jacks occasionally results in a take. The fishing has been very good in here this past season but we may have seen the last runs of the silver fish from here. Fishing pressure seems to be low on here, we saw about three cars here today. 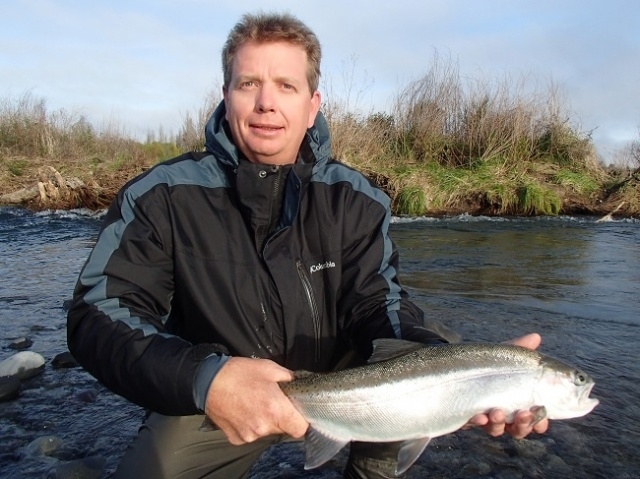 Out on the river early again tomorrow and looking forward to hitting the Tongariro once again, really a nice feeling to be out and about and confident to be catching fish in most places once again. We are certainly blessed to have all this at our doorstep and in New Zealand.